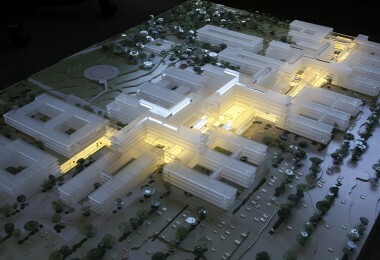 The human experience is at the center of our design of AUH Forum, a hospital complex in Denmark’s second-largest city that will include the Steno Diabetes Center Aarhus, a patient hotel, research facilities for the Department of Clinical Medicine, a pharmacological department, and a church with areas for faith and contemplation. The project combines landscape, functionality, and infrastructure to provide patients with security and serenity while being an efficient workspace for hospital staff. The 22,350 m², 14-storey building complements the Aarhus University Hospital in Skejby, Denmark. It serves as one of the hospital's main entrances, becoming a focal point and a landmark for the entire building structure. In close proximity to a spacious new park, the project is organised across two floors on an intimate scale. The building connects existing circulation paths and unlocks the potential of its central location. The relationship between inside and outside creates cohesion between building and landscape, and is essential to understand both the project’s DNA and AUH Forum’s special character. The main entrance links the hospital's northern and southern areas via connecting corridors. AUH Forum then becomes the heart of the entire university hospital. In the infrastructural “junction” where the north-south connection lines meet, we have created an inviting internal space. The atrium provides equal access to all functions of the building from the arrival area. The efficient and functional layout, paired with an inviting pathway, answer the call for a calm and undisturbed environment. Around the atrium, a structural landmark rises as a simple and cubic building volume. AUH Forum appears as a composition of connected cubic volumes that together create inner courtyards to maximize daylight. The lower two floors open up to the park, whilst the towering landmark rises up and opens its façade towards the main entrance. The main ideas behind AUH Forum's design are intimacy, presence, human scale, and a relationship between inside and outside translated into a clear scale and practical layout. The project will support culture and research, with an inviting format that encourages knowledge sharing across departments both horizontally and vertically. The courtyards play a central role in the experience of the AUH Forum and the Steno Diabetes Center as a calm and safe place for visitors, patients, and staff.